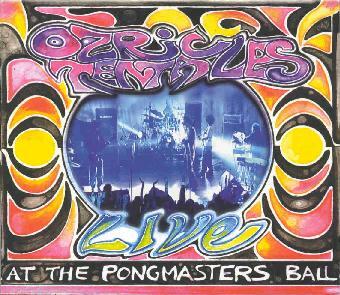 Ozric Tentacles - "Live At The Pongmasters Ball"
What a surprise to see this released on Snapper, but I am glad to hear that the Ozrics have renewed their activities with the label. Anyway, this was recorded at the end of October and there was to be an acommpaying DVD with Eat Static and Nodens Ictus released on Sept 23rd. Several months after the announcement, the Eat Static and Nodens Ictus were said not to appear on the DVD. I think there was some disagreements with Joey and Merv and the others about the quality and whether to put it out. Anyway, this was an awesome concert by the band with a mixture of the songs we always hear and some that we have never heard live before! The band do a great job of mixing in some super cool jams at the ends of Myriapod and Pyramidion. The highlights of disc 1 are the excellent spaced out "Oakum" and the two old pieces the band never played live before this tour, "Its A Hup Ho World" and the "Domes Of G'Bal". I think the version of "Pixel Dream" on the Pyramidion EP was superior to this one. Disc 2 starts off with the excellent "Saucers" from Strangitude followed by "Dissolution". The band had not played "Kick Muck" much over the past few years but have brought it back into the set. The CD closes with a long spaced out "Throbbe". A great double live CD that all fans of the band new and old must have. I can't wait to see and hear the DVD! It's really too bad that Zia has decided to leave the band. This will be your last chance to hear and see him live with the Ozrics. For more information you can visit the Ozric Tentacles web site at: http://www.ozrics.com.